Google on Wednesday released a suite of business tools for Google+ users. Google is offering these tools for free till the end of 2013; however users need to have a paid subscription to Google's cloud-based software for businesses, Google Apps, for uninterrupted access. The new business tools allow business users to control who can see their posts on the social networking website and features integrated video conferencing and improved administrative controls over the posts and who can see them. Google is giving a full preview of the features to Google Apps users. Moreover, users can also add a hangout to a Calendar event. 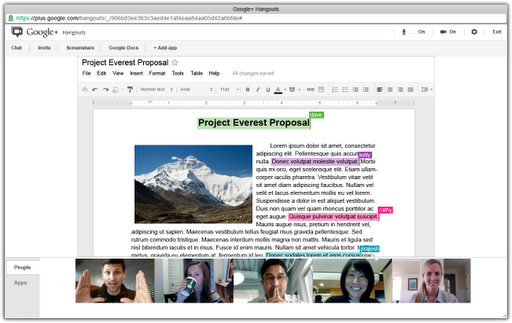 It may be noted that Hangouts was previously accessible via Gmail and via Google Docs. Administrators now also have the option to restrict Hangouts for private meetings. Google is currently working on the mobile version of the new business suite along with more administrative controls. "On the Google Apps team, we wake up every day excited to work on products that are powering a fundamental shift in business technologies," said Clay Bavor, product management director for Google Apps in a blog post. "Whole companies are moving into the cloud, where they rely on the same Web-based applications their employees use at home: Gmail, Google Calendar, Google Docs and Google Drive." The Internet giant has rolled out quite a few updates to its social networking website to make it as good as other popular social networks such as Facebook and Twitter. On Wednesday, Google added 'birthday reminder' features to Google+. The new feature lets users now see birthday notifications on the search page. Find out more about Google's birthday reminder feature here.